Inter-tain production’s Emile Wolsky brought Xite Labs aboard to help create a complex projection mapped animation experience for the 2017 Panasonic booth at the CES show in Las Vegas. 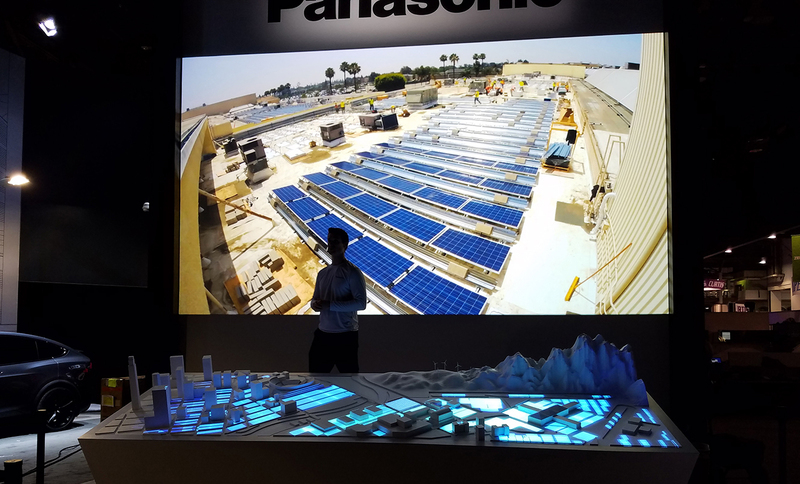 Panasonic may be best known for consumer electronics, but it has started moving into high-tech smart city design in recent years. This project helped visually illustrate the various metro components of the smart city infrastructure. Autonomous vehicles, smart LED street lights, smart bus stops, smart parking meters, connected vehicles, connected planes, smart homes, pollution sensors and solar powered microgrids. The goal was to project on all 4 sides of the set piece, illustrating the smart city metro areas of focus across the miniature. Using Lightwave and Cinema 4D our team painted the picture of a futuristic “connected” smart city across the set piece . Complex UV surface animations were created on the original 3D city model. We also created fly-through animations for 16×9 rear support screens. The challenge of ambient light in the booth proved significant, but the projection and corresponding images on the set still came through and helped to create a lively part of Panasonic’s booth at the 2017 consumer electronics show.